BANGKOK: The Constitutional Court has unanimously ordered the dissolution of the Thai Raksa Chart party for nominating Princess Ubolratana as its prime ministerial candidate, citing customary law. As a result of the party dissolution, the court decided 6-3 to ban TRC’s 14 executives as of Feb 8 from running in elections for 10 years. It also unanimously banned TRC’s executives from setting up parties or becoming executives of other parties for 10 years. 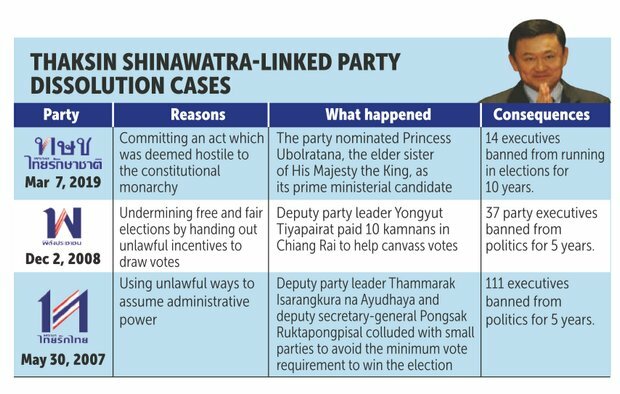 The EC earlier decided the party had violated the election law by committing an act which may be deemed hostile to the monarchy when it nominated Princess Ubolratana, the elder sister of His Majesty the King, as its prime ministerial candidate. The EC acted by the constitution which requires it to ask the court for the disbandment after it found the party had broken the election law. The court said almost all constitutions stipulated the king and the royal family of the ranks of mom chao or higher must be politically neutral. “Entering politics undermines that position, which could lead to the end of the institution,” it said. TRC’s action could undermine the institution because the princess is the eldest child of late King Bhumibol Adulyadej and a sister of His Majesty the King. “By bringing her to politics for its advantage, the party ignores a fundamental value of the rule of constitutional monarchy and puts the institution at risk. Its action is deemed hostile to the rule of constitutional monarchy,” a judge said. “Although TRC has the right and freedom to do so, their action must not have an adverse effect or undermine the rule of constitutional monarchy or compromise the political neutrality of the monarchy,” the court said. The ruling, which is final and binding, was delivered at the court on Chaeng Wattana Road in Bangkok on Thursday afternoon amid 1,000-strong security in a 500m radius. TRC leader Lt Preechapol Pongpanich said after the ruling he and other party executives were “deeply saddened”. “No matter what status we’re in, we’ll do something good for the country,” he said. The EC submitted the case to dissolve TRC to the court on Feb 13 after TRC nominated the princess on Feb 8. Earlier, some non-executive TRC MP candidates asked the court to take into consideration their right to run in the upcoming election since a party dissolution ruling deprives them of the right to run even though they had nothing to do with the decision. A high-ranking EC official earlier said if the party was disbanded, the candidacy of all of its 282 MP candidates would be automatically invalidated in the March 24 election. Any votes they may get on that day will be treated as bad ballots. Thammasat University vice-rector Prinya Thaewanarumitkul said on Wednesday a TRC dissolution was unlikely to change the political landscape since people who would vote for anti-regime TRC were unlikely to turn to support a pro-regime party and many made voting decisions based on who they wanted to see as prime minister. 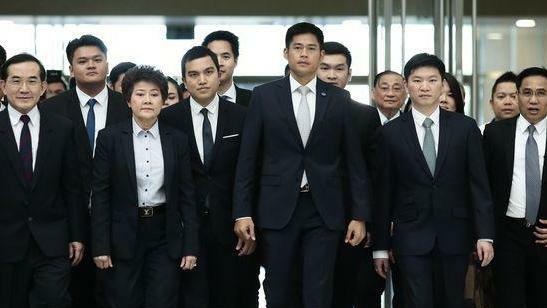 TRC, an offshoot of the Pheu Thai party, announced on Feb 8 – the deadline for the submission of prime ministerial candidates to the EC, Princess Ubolratana as its only prime ministerial candidate. But at around 10pm the same day, His Majesty the King issued an announcement saying the nomination was highly inappropriate and close members of the royal family are above politics by tradition and must be politically neutral. Princess Ubolratana resigned from the royal family after she married an American. She had lived in the United States before returning to Thailand in 2001 after they divorced. The approach to the national elections are not very promising for the thai people.